Incredulously enough City Council asked the very person at the root of the Chem tank cover up scandal to issue a report, which he did last month. Bob Peters is the number two in our Economic Development office. His tome to council reads like a game of Three Card Monte. See the joker? Follow the joker. Where did the joker go? Sadly the joke is on the taxpayers of Cornwall. The question is why has council accepted this, and will there ever be an investigation into what really happened and who is behind it? 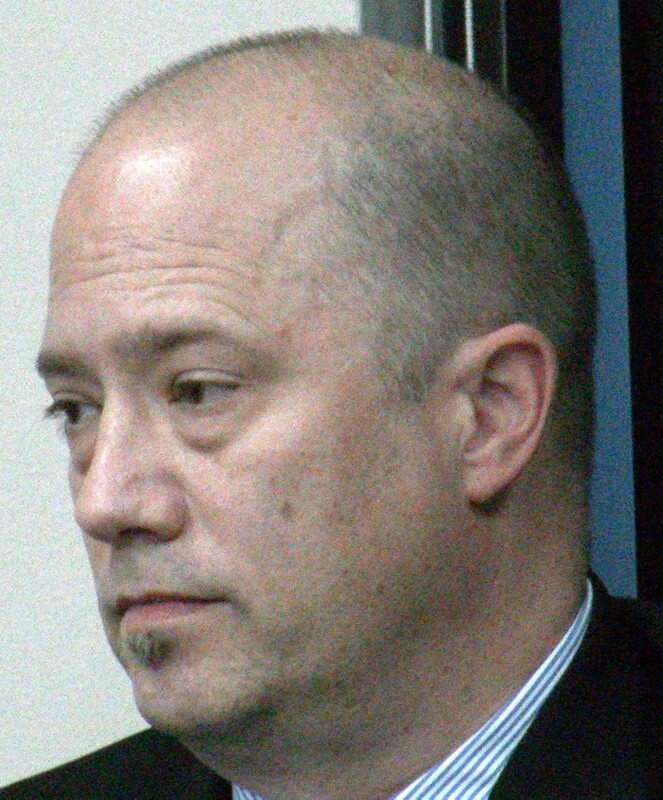 Mr. Peters has some unexplained history of his own at City Hall. The rumors, which have persisted for decades now, is that he left City Hall during his first run in the 90’s over misuse of a City credit card at a house of ill repute while on a trip to Eastern Europe, allegedly to land a furniture company in our city. Mr. Peters left to the private sector to work with Peter Gault who currently is the President of Team Cornwall. Mr. Peter’s wife at the time also landed a plum gig at City Hall which clearly was a step up from Farmboy, and she still retains the position to this day. Peters was brought back to Economic Development after helping former Mayor Bob Kilger get elected. He also was caught working on the Mayor’s campaign to get re-elected during office hours. What we know clearly is that the city knew about the Chem Tanks going back to February 2013 when Economic Development was first contacted, and then confirmed later in the Spring before the poorly played drama in December when Kilger and some of council acted shocked and surprised at the sudden construction of the chem tanks on a waterfront property right across from a luxury condo development. Kilger was caught lying about knowing when he himself knew about the tanks after declaring he only had found out in December when he had clearly talked about it at a Waterfront Committee meeting in the month before which again begs the question of how far back did he know about the project? The issue came up during the Federal election when Liberal candidate Bernadette Clement tried to score points with the issue with MP Guy Lauzon. Clement, a close supporter of Kilger was on council during the Chem Tanks and is a current councilor, lost the election as the facts on this issue clearly were on Lauzon’s side. That Clement would even go there was odd as she certainly wasn’t that loud when the incident occurred. CFN first broke the letter from Transport Canada that clearly showed Economic Development knew about the issue yet not a single councilor has publicly held ED responsible although councilor Maurice Dupelle deserves credit for at least pushing the question into the public arena. 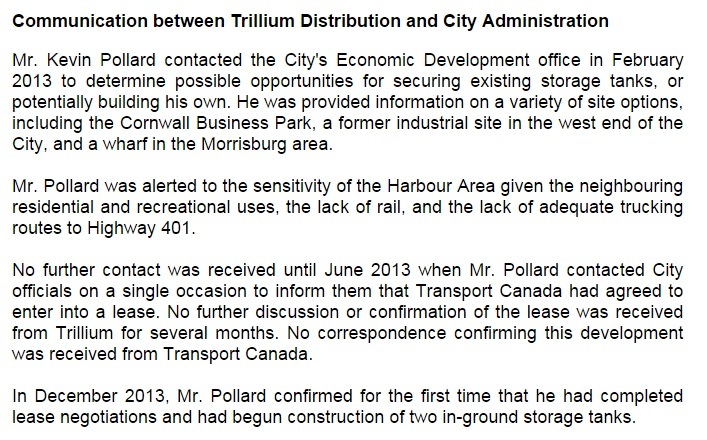 If Mr. Pollard was alerted to the sensitivity why wasn’t council alerted in the Economic Development report to council at that time? Or in the June report? Why wasn’t council alerted before the construction began when any of the few chances to stop the tanks on the waterfront could be exploited? Notice the last two paragraphs. In June the city is notified that there was a lease about a project that they had discussed in February? Then in the next paragraph, without stating context or who contacted whom, that the construction would be for tanks? Even Gerry Samson could figure that donkey poop out. What does this have to do with the price of corn in Alaska? IE, this section is a CANARD. 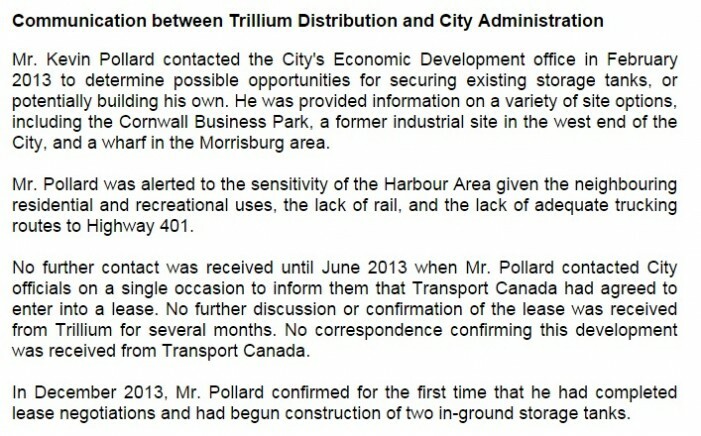 It’s misleading as it was Economic Development that were the point people with Mr. Pollard. As planning was never contacted for the project why would they be expected to have any knowledge of the project? 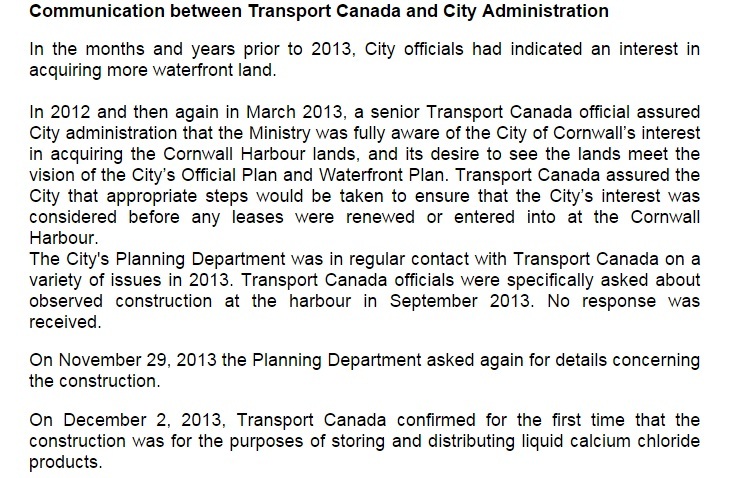 Transport Canada did not owe the City any communication. 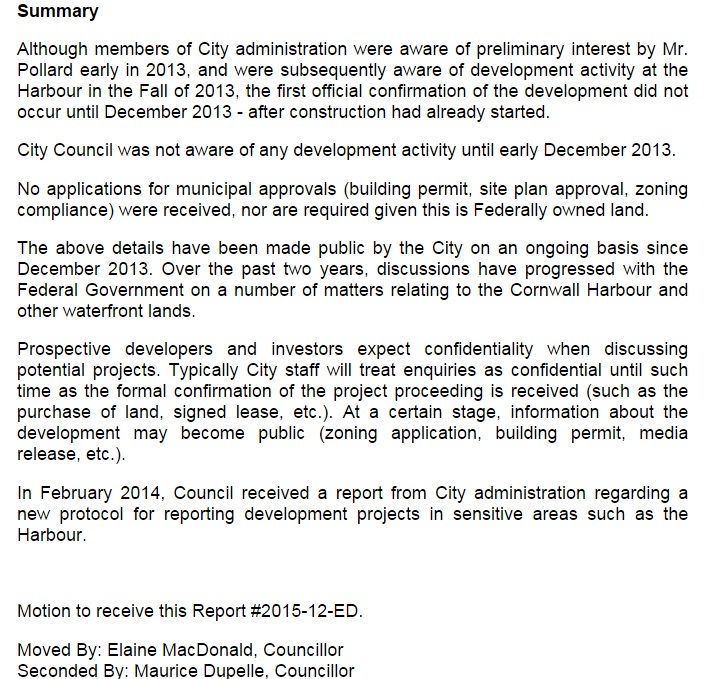 A bigger question was why didn’t the city clearly contact any concerns of the project in February or June of 2013 to Transport Canada, why not show or discuss those concerns to TC if that ever happened in this report? Again, if Council were notified then if they were concerned they could have directed Economic Development or any department to get actively involved in the process? This is spin. The City never took Transport Canada to court over the issue nor did any elected official get an independent opinion. 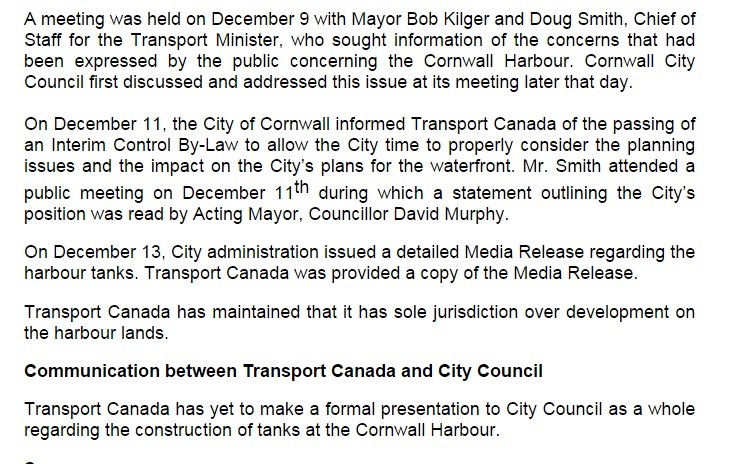 Transport Canada doesn’t owe the City to make a presentation, formal or otherwise for using its lands which were used for tanks previously, especially as Pollard had in fact contacted the City. Again, if council was informed they could have taken pro active steps to attempt to stop the tanks, but council, or at least part of council, were not informed. Again, the cover up was given a coat of varnish. Clearly former Mayor Kilger knew of the project before December. Would it be unimaginable to think that his trusted friend who worked intimately with him on getting elected and then re-elected would not have at least informed him? Do we have any other example of Kilger going rogue and working on issues without the official knowledge of council? We actually do; courtesy of current mayor Leslie O’Shaughnessy who sat on this council, but left prior to the chem tank scandal. O’Shaughnessy clearly states his frustration with Kilger admitting that he’d engaged city lawyer David Sherriff Scott regarding an initiative to monitor this very newspaper and a pending lawsuit about to be issued prior to discussion with council. The article in question was an expose of… Bob Peters. The threat by Sherriff Scott was published by CFN. Again, O’Shaughnessy asks how can you give approval without asking council? Is it possible that Peters and Kilger clearly knew about the chem tanks which begs the larger question is why were some on council not informed of the chem tanks? And again, once those councilors discovered these simple facts why have they chosen to remain silent? Isn’t it time that a legitimate outside authority investigate what exactly happened and who exactly did what? Can we trust City Hall when they cover up messes like that which will impact future development of the City? Will those at City Hall who consider behaving in this manner hesitate if they know that there are no consequences? The answers are there, but it will take the public and council to push for to ask the questions. What do you think dear CFN viewers? You can vote in our poll and post your comments below. Time to stand up to the corruption in our city counsel and Mayor’s office. To do nothing, is to be an accessory after the fact. How long Cornwall will you allow our elected public servants to deceive and lie to us? Demand your rights and call for all of their resignations immediately, and call for a new election. It is your city! Good luck PTN with getting one member of city council to resign, let alone all of them. As well good luck with the accessory to a crime. Nice play on words though. Newton, in Canada, an elected politician cannot be removed from office unless he/she is convicted of a serious crime, or he/she becomes incapacitated and is no longer able to fulfil the duties of the office. A politician cannot be removed because you don’t approve of their morality. Furtz putting your personal issues with PT aside, if 5,000 people signed that petition it certainly would have an impact at City Hall. Symbolism can be a very loud message. And if enough people talk about a subject it’s the stepping stone to change. While I agree with you in principle, I think a strong amount of signatures would give many pause to consider what’s going on at City Hall. Unfortunately, once a politician is elected in Canada, nothing can be done to change the situation until the next election. That’s why we should be very careful about who we elect in the first place. Jules, you watch too much American TV. There are no provisions in Canada to impeach an elected politician based on sleazy behaviour or dishonesty. Rob Ford comes to mind. Defeatist attitude? I don’t agree. It’s accepting reality. It doesn’t mean we have to like it or have to sit and take it. For those who don’t like the freedoms, etc we have the exit door to another province or country is always open. Every now and then, you are pretty funny, Newton. Does this mean you’ll be heading back to California where freedom reigns? Gawd knows that our Canadian way of life must drive you even more nuts. Jules, the only way to find peace is to roll up a big bat,and smoke it on your balcony. When it’s all gone, come back inside and listen to CBC radio. I’m glad to know you kicked the TV habit. I’ve been TV free for almost thirty years. Feels good. Marlborough Street has been nicely paved too, at our expense, in order to handle the Chem Tank traffic. Lassie….uhhh no. The work done on Marlborough Street has been planned for years. Last year they did the section from Second to Third street. Further to the notion that Marlborough development has nothing to do with Chem Tanks. Well… it was more than several years ago that Transport Canada approached all stakeholders and municipalities to discuss Port Divestiture. Kilger thought he’d be around forever as did his friends, and that’s when the ball started rolling toward commercializing the waterfront without a thought to incompatible development, or the quality of life for Cornwall residents Afterall, at the time neither Kilger nor his buds even lived in Cornwall. The only win for Cornwall has been when thankfully, Councillor Grant’s development got shot down. Commercial development of the waterfront will never happen.